Head of the popular anti-siege committee, MP Jamal al-Khudari, said Tuesday that Gazans have been grappling with abject living conditions due to 2014 Israeli war and the slow pace of the reconstruction process. 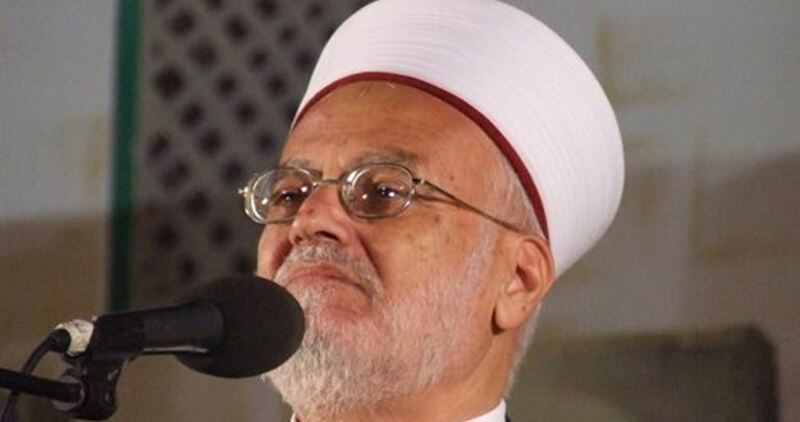 Speaking in a press statement, al-Khudari said the Israeli occupation authorities (IOA) have been blocking the access of reconstruction materials into the besieged Gaza Strip since May 2016. According to al-Khudari, 65% of civilian homes which were destroyed in the Israeli offensive of 2014 have not been reconstructed yet. He added that 60,000 civilians have gone homeless and subjected to dire living conditions due to the exacerbating socio-economic crises rocking the besieged coastal enclave. MP al-Khudari urged the donor parties to fulfill their financial pledges and dispatch aid to Gaza so as to reconstruct the destroyed homes at the soonest time possible. He further called on the international community to exert pressure on the IOA in order to allow a free access of reconstruction materials in Gaza. 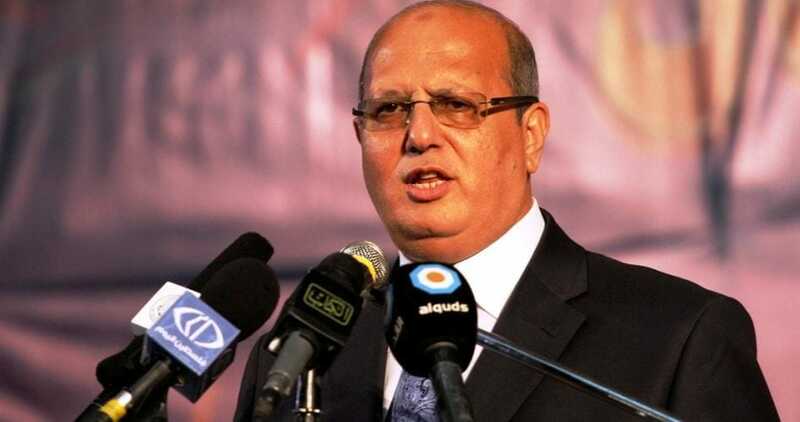 Al-Khudari warned that the Israeli decade-long blockade and closure of border crossings, along with the restrictions on the access of rebuilding materials into Gaza, will result in a ten-year delay in the reconstruction process. 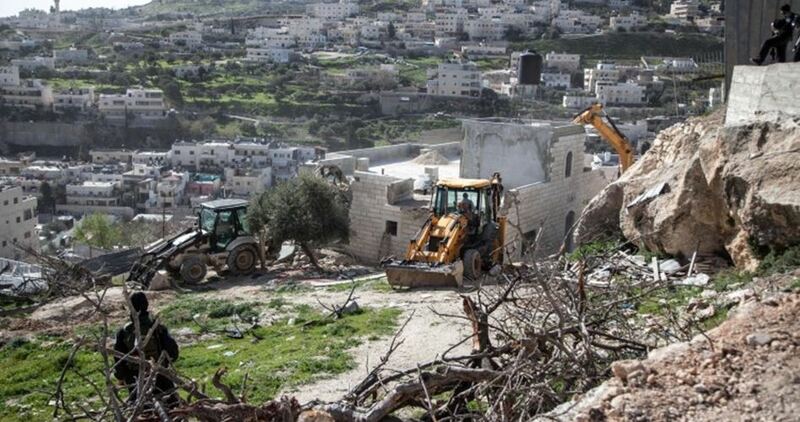 The Israeli occupation authorities (IOA) had approved 35 Palestinian structures in C areas of the West Bank and gave demolition orders to over 2,000 other structures during the past three years, the Israeli daily Haaretz said on Tuesday. Haaretz said the number of Palestinian structures demolished is 18 times more than those approved. According to the information from the Civil administration, in 2014, nine building permits were approved. In 2015 seven were approved and in 2016 only 37 were approved. In exchange, 2,000 demolition orders were given, 983 of them have already been carried out. The Civil Administration said that it has no information on the number of permits given to Israeli settlements because they are not responsible for that issue. However, it said that in 2014, 865 demolition orders have been given to settlement units, and only 438 of them have been demolished. Area C constitutes over 60% of the occupied West Bank, and falls under Israeli Civil and Military control. Israel continues to demolish Palestinians homes in the area in favor of Israeli illegal settlements that are deemed illegitimate under international law. The Palestinian MP and head of the popular committee against the siege Jamal Khudari warned in a statement issued on Friday that Israel’s siege on Gaza has caused heavy losses to the commercial and industrial sectors. The 10-year siege has targeted all elements of economic progress and economic development, he said. The Israeli authorities continue to prevent the entry of nearly 400 commodities into Gaza Strip in addition to the construction materials, which delays Gaza reconstruction, according to his statement. He pointed out that thousands of people are still homeless although more than two years have passed since the Israeli war on the Strip came to an end. Over a million and a half of million Palestinians in Gaza rely on humanitarian aid, Khudari added. The independent MP concluded by calling on the international community to work urgently toward ending the Israeli siege and accelerating the reconstruction process. Jerusalem into land for settlement construction, leaving only 13 percent of the area for Palestinian construction, amounting to a severe housing crisis and forcing many Palestinians to build without a permit. Israeli authorities ordered Palestinian residents of Ras al-Ahmar locality, in the northern Jordan Valley, not to build power lines in their area, a local official said. Mu’taz Bsharat, who monitors settlement activities in the area, told WAFA correspondence that Israeli troops served locals with an order to stop the construction of a 600-meter-long power line along the road leading to Ras al-Ahmar. Residents of the area considered part of Area C, which is under full Israeli military control, are not allowed to build power lines or water pipes to their villages. They say that Israel wants to push them out of their land, to eventually take it over for the construction of Jewish-only settlements. The Jordan Valley makes up about one third of the total area of the occupied West Bank. 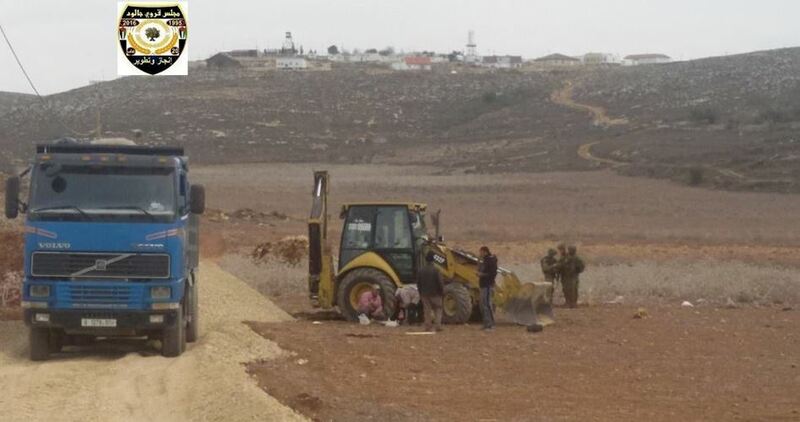 The Israeli Occupation Forces (IOF) issued Sunday evening a stop work order against rehabilitating an agricultural road in Jaloud village, south of Nablus. 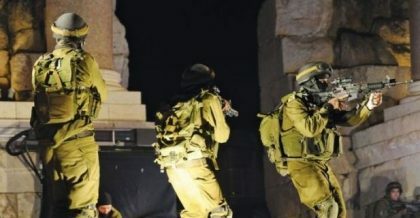 The Village Council affirmed that Israeli forces detained late Sunday the Palestinian workers and confiscated their tools. The workers were then released after nearly a two-hour detention, the sources added. 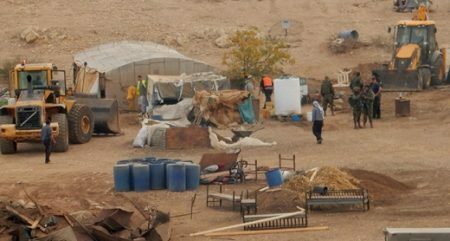 The Israeli forces threatened the workers to confiscate their bulldozers and other tools if they continue the rehabilitation working. According to the source, the rehabilitation project was funded by the Italian Civil Volunteer Group (GVC) in collaboration with the French international relief. The notified road was to be rehabilitated to best provide services for Palestinians in Jaloud village and to protect the village from Israeli settlement expansion.